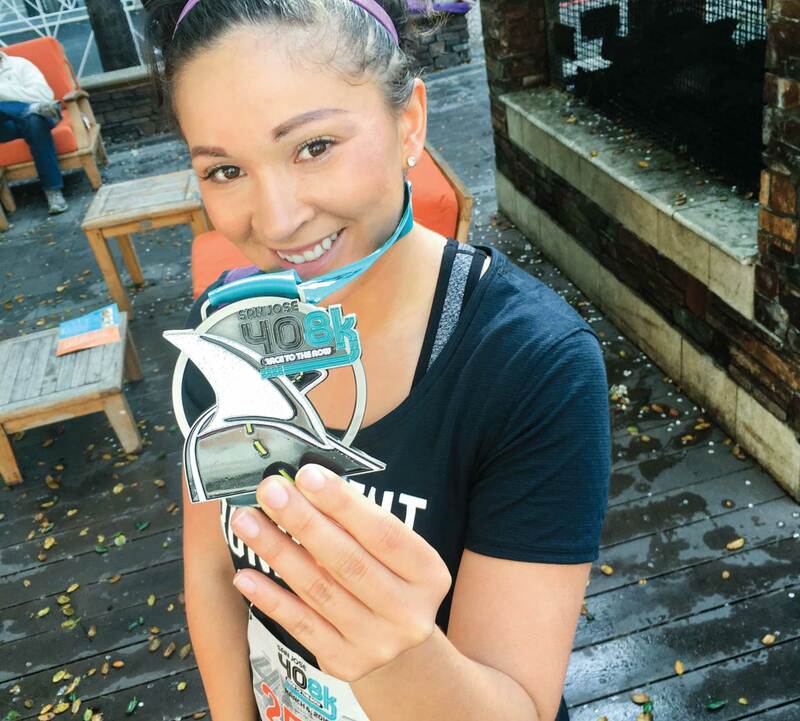 I ran my third race of the year on Sunday morning (what, what! 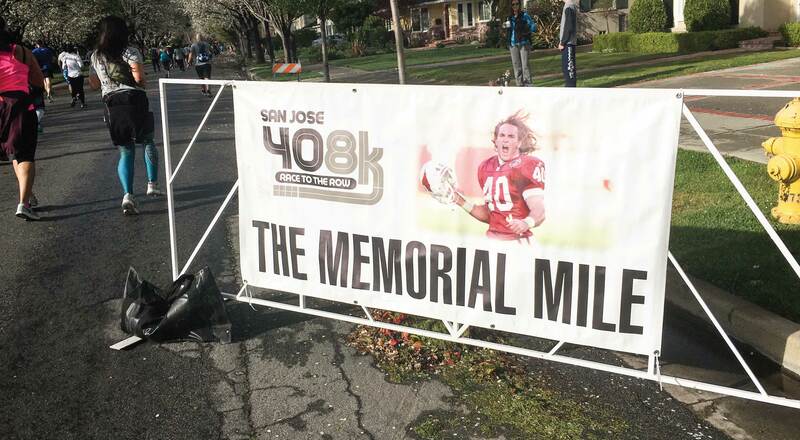 ), the San Jose 408K. It’s also my third time running this particular race. It’s so good, I just keep coming back! El Niño hit hard and it poured rain ALL day and evening the day before the race. It was so bad, Oakland had rolling blackouts and my neighborhood was affected…while all of my running clothes and socks were in the washer, mind you. Fortunately, power came back on within the hour, I was able to finish washing and drying my running gear for the morning, and we woke up to a gorgeous, sunny day. 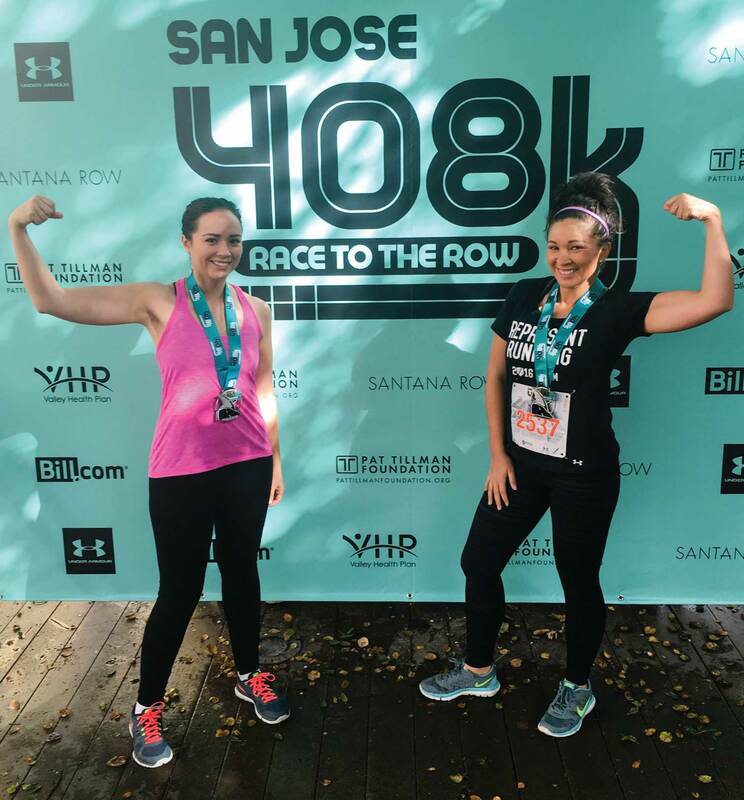 The 408K is a quick 5km run (4.97 miles) that starts at the SAP Center in downtown San Jose and ends in Santana Row, the perfect setting for enjoying a post-race mimosa or two. It’s an incredibly flat course sprawling the suburbs of San Jose, with only two minor hills along the route. 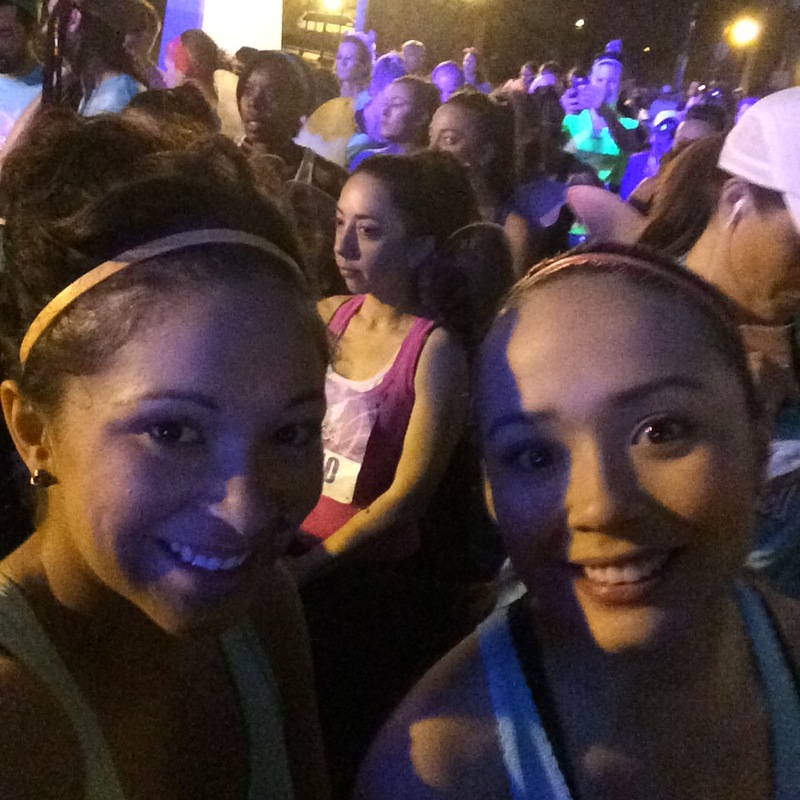 I ran this race with my sister Mikayla, who has made it her goal to run more this year. We arrived early so that I could take a few photos with the Represent Running ambassador team (which I’m excited to be a part of this year! ), get warmed up, and take in the race day energy. We crossed the start line at 8:19 and headed down the Alameda, then down neighborhood streets lined with beautiful blooming trees. Around Mile 4 we hit Memorial Mile, which always gets me all emotional. Veterans and active military line the street to cheer on the runners, and it’s such an awesome opportunity to thank them for all that they do. It’s also a great tie-in since the 408K benefits the Pat Tillman Foundation. Then it’s onto Mariachi Mile, the last stretch of the race. 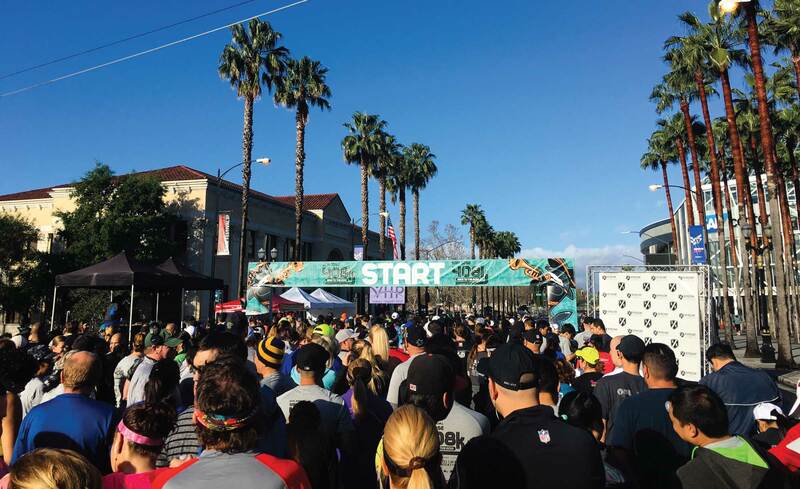 At this point, the sides of the route are dotted with various mariachi bands, all playing music and cheering you on to the finish as you pass by Valley Fair Mall, down Stevens Creek Boulevard and into Santana Row where you can collect your finisher’s hardware. It’s SO well-organized. Shout out to all the volunteers and Represent Running staff! Veteran’s Mile and Mariachi Mile are great. The shirts and medals are always unique and well-designed. It’s fun, easy, and flat, which makes this race inviting for new or non-runners. I think I really realized how much I love running as I waited to cross the start line at last year’s run. I even wrote a blog post about it. The 408K is one of three races in the Run the Bay Challenge. If you run all three races (one in San Jose, one in San Francisco, and one in Oakland), you’ll receive a super medal. After the run, we drove out to Willow Glen to enjoy a post-race Swirl at Aqui’s, followed by brunch at Bill’s Cafe. 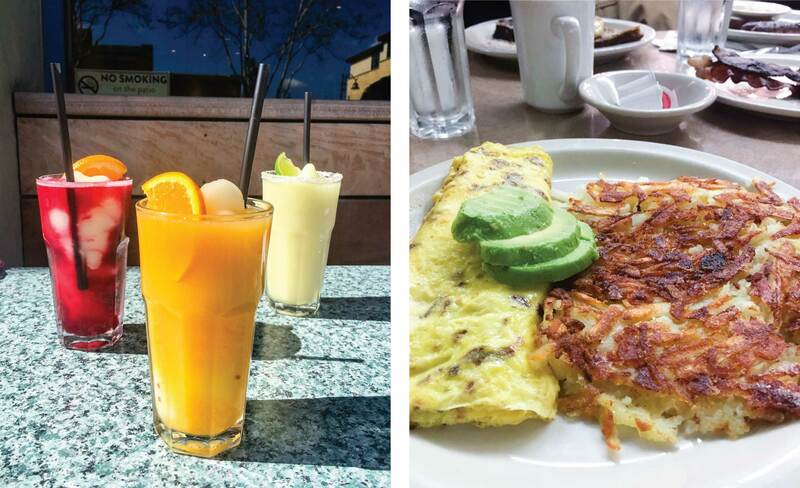 Truth: frozen margaritas and crispy hash browns are all you need after crossing a finish line. 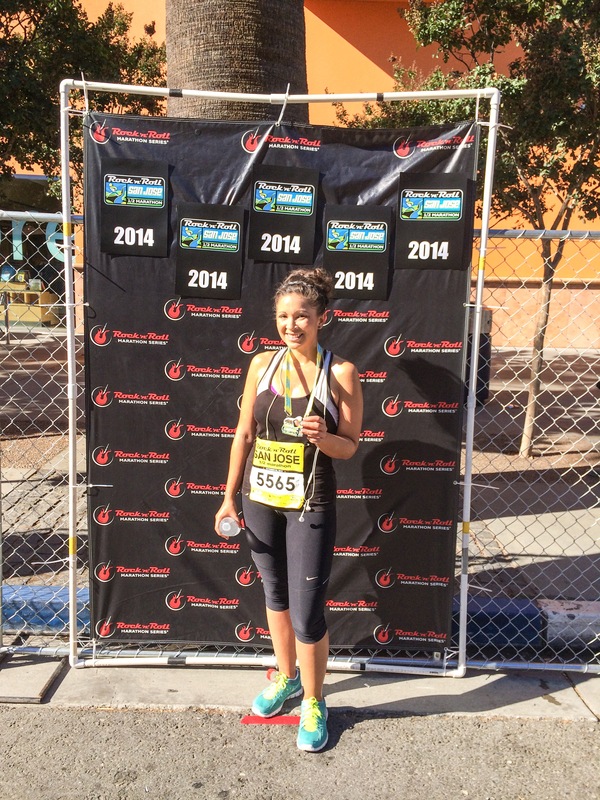 Overall, it was a great way to spend Sunday; plus, the 408K got me all kinds of excited for my upcoming races in 2016! If you’re interested in signing up for the Across the Bay 12K and 415K, use REPRESENT2016ML to get 10% off registration. Let me know if you’re going! Hope to see you there or out on the pavement sometime! Whether you’re going home for the holidays, or evading the end-of-year craziness by taking off on a December getaway trip, you don’t have to give up exercising just because you’re traveling. If you’re like me, you love to be in new places and/or visit family, but you still want to keep your fitness routine going while not near your home gym. I’m one of those people who after missing more than three two days of working out finds it extremely hard to hop back on the gym train. So fitting in workouts when I’m traveling is a must-do, especially because my travel plans—like any good food lover—always include partaking in the many delicious eats and drinks of a new place and/or home. 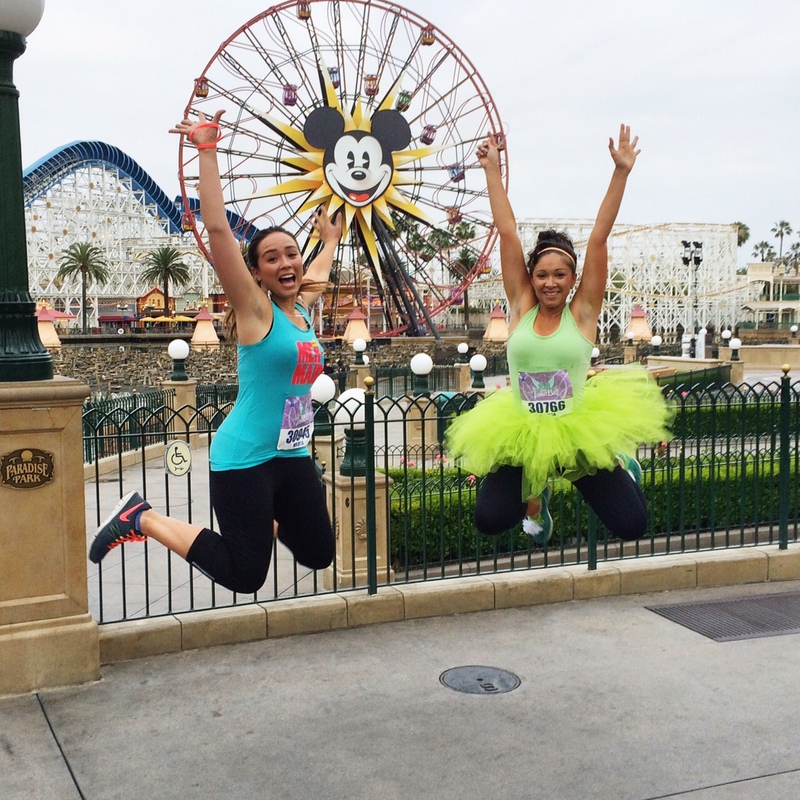 On Saturday, my sister and I ran our first Disney race in Anaheim, the Tinker Bell 10K. Can you tell from the picture above that we were pretty happy about it? It was Mother’s Day weekend, so the two of us drove down from the Bay Area and picked up my mom from LAX on Friday night so that the three of us could enjoy the park together after the race. The race started at 5:30 am, which is the earliest race start time I’ve ever had. Fortunately, my mom dropped us off at the starting line at 5 am to warm up and get into our corral. My sister and I started in Corral B together with the plan to stay together the entire race. The only race she had ever completed was a Color Run 5K, and she had never run 6 miles before, so she was a little nervous about finishing. Fortunately, I knew this wasn’t a race to speed through, understanding that there would be tons of people on the course and lots of photo opps, so we planned beforehand to just take it easy and stick together the whole time. I have to tell you, it was surprisingly easy to run in a tutu. If you run a Disney race, my #1 advice is to wear a running costume. That, and stop for the pictures. No PRs in the happiest place on Earth! 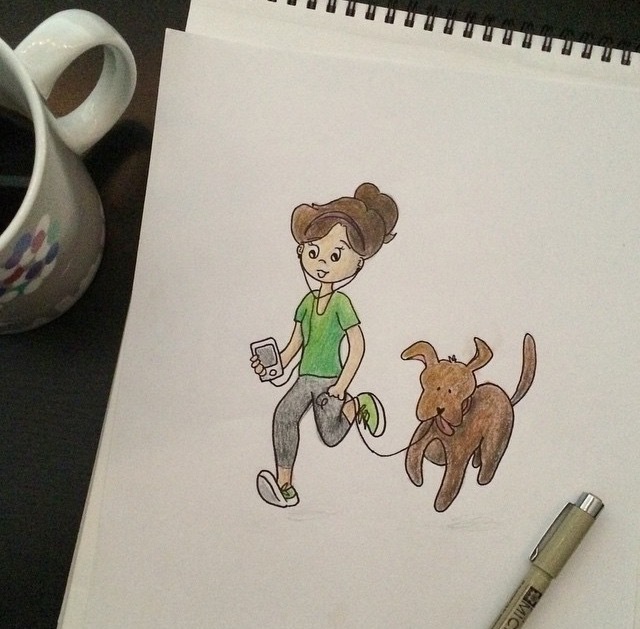 Does drawing yourself running count as beginning to train for a race? Do you know what I love more than running? Fortunately, the folks at the See Jane Run series understand the amazingness of this trio and host an annual women’s half marathon in the Bay Area with chocolate and champagne at the finish line—the See Jane Run Half Marathon San Francisco. The 13.1 mile course runs through Alameda, California with beautiful views of the San Francisco skyline, and while I’ve never run it myself, I’ve heard great things about it from others. I signed up for the race last night and am putting in my first official half marathon training mileage after work today. EXCITEMENT! The race is on June 21st, so that gives me 8 weeks to train harrrrrd. 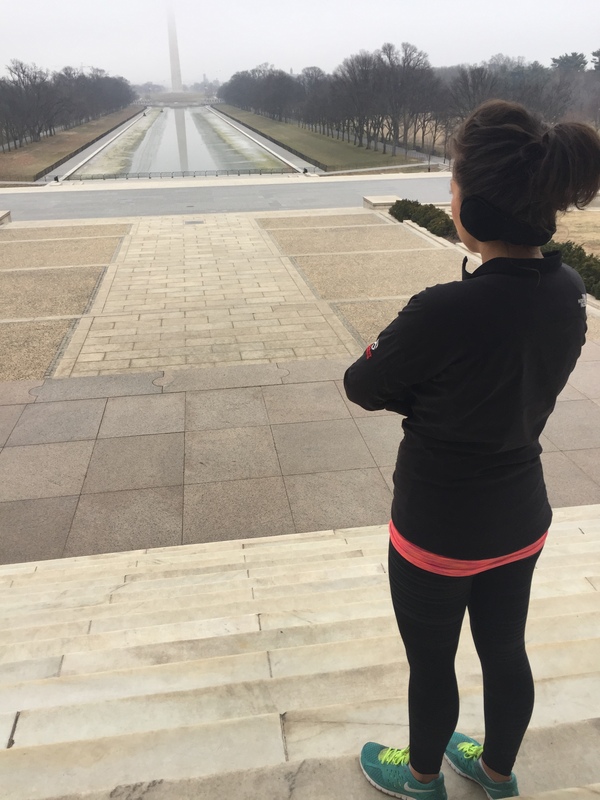 In the past, I’ve stuck to a 12-week training plan, so with only 2 months on the calendar, I definitely can’t let myself slip or skip too many runs. Do you have a good 8-week half marathon training plan? Shout out if you’re also training for an upcoming race! P.S. Learn more about the See Jane Run Bay Area race; there’s also a 5k! It’s Friday (!!! ), and I’m looking forward to spending tons of time outdoors this weekend. I’ll definitely be lacing up my shoes for a lakeside run on Saturday, and copious amounts of asparagus and eggs will surely make their way onto my brunch plate. Other than that, I have some 90’s party decorations to make, a bridal shower to start planning, and, of course, Easter Sunday to celebrate! If you need a few cubicle distractions to entertain you before quittin’ time today, check out some of my favorite articles and videos from this week! Want to learn how to do a handstand, but totally afraid of ’em? Watch this video! 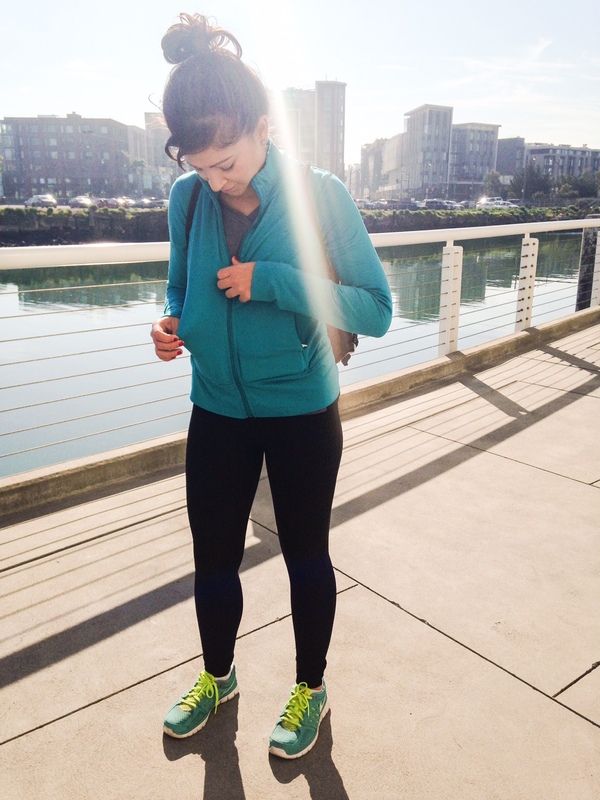 Live in the East Bay and love running? Check out this list of great local running trails. Navigate the market like a pro with this seasonality chart for vegetables. This power breakfast featuring poached eggs, sweet potatoes, and tomato avocado salsa and is the perfect Easter brunch recipe. On Sunday I ran the San Jose Rock ‘n’ Roll Half Marathon, my second half marathon to date, and had a great—albeit sweaty—time. With 90°+ temperatures all weekend, I knew I’d get hot during the race, but I didn’t fully realize how challenging it would be to run in the heat all morning until I was mid-race. Much of the course was exposed to the sun, and, due to a relatively late start time of 8 AM, I spent most of the race either on the hunt for Gatorade stations or daydreaming of cannonballing into a swimming pool. Besides the heat, the San Jose Rock ‘n’ Roll was a great race. Admittedly, I didn’t make my goal time (my race time was 2 hours exactly), but it was a great learning experience that taught me a lot about training for my next half marathon. Mostly, I started out way too quickly. During my practice long runs I focused on running negative splits, but on race day I let my excitement get the best of me and ran each of my first three miles 1-2 minutes faster than I should have. By Mile 10, I was exhausted, and the heat really took its toll. If you can pace yourself better than I can, I highly recommend this race for fellow beginners, as well as anyone looking to PR, due to its flat, easy course. It was also a very well-organized race. Tons of volunteers staffed water, fuel, and sponge stations, and the 20+ waves at the start line were well-staggered, which meant I never felt crowded or like I was running as a part of a herd. My only big complaint is that there wasn’t as much live music as I anticipated. For a “rock ‘n’ roll” half marathon, most of my race would have been silent had I not prepped my own race playlist and brought my headphones. Overall, this was a great race, and I would love to run it again! The month following my first half marathon at the Oakland Running Festival, I ran very little and felt momentarily disenchanted with running, but this time around I feel more dedicated than ever to improving my speed and training smarter. After a day of rest, I’m back at it and looking forward to finding another half marathon to train for!